In my cleaning frenzy I thought “Boy it must be slippery when Delbert lands here.” Of course I had no evidence to support that thought. However I still decided I should place a nice non slick substrate on the microwave. My material of choice was a piece of a purple yoga mat. His confident expression turned to eyes wide open followed by some strategic aerial maneuvers to get the heck outta Dodge as they say. Guess who spent the rest of the morning retraining Delbert to step onto the microwave? Sometimes we take for granted that a bird should do something we request, like stepping onto an unfamiliar or changed perch. There are many times I have watched someone quickly bring a parrot up to a perch, only to watch that bird lean far away to avoid it. 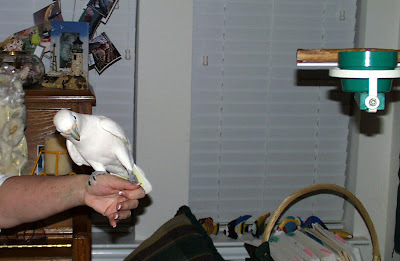 In many cases people start wriggling their wrist and force the bird onto the perch. This often leads to a bird who leaps off of the perch once on it or shows body language that indicates he can’t wait to leave. I much prefer a parrot who eagerly steps onto a perch. To get this kind of response, I pay attention to my bird’s body language. I try to make sure the bird is as comfortable as possible. I will offer treats as we approach the perch. If the bird ever shows the slightest fear response, I stop moving towards the perch. In essence I break even this behavior into small approximations. Over time the birds learns stepping onto a new perch means lots of treats. At a recent parrot behavior and training workshop I taught, I went through this process with two parrots. I wanted a hyacinth macaw to step onto a table. It took me about 10 minutes of tiny of approximations to finally get her to step onto the table. During the process I had to stand in some weird positions so that she was comfortable. But she did it! A little poicephalus parrot also went through these steps. In just a matter of seconds she learned to step onto the table as well. I then went on to work with her on getting comfortable with a towel. You can see pictures from this event on my twitter page . Slowing down and taking a few extra moments can make a world of difference to a parrot, especially when your parrot is afraid of something new. So even though I created a little set back for Delbert. We were able to get past it with a just few minutes of training. It is funny to me because….I really have not done anything too special : ) Here is the lowdown. 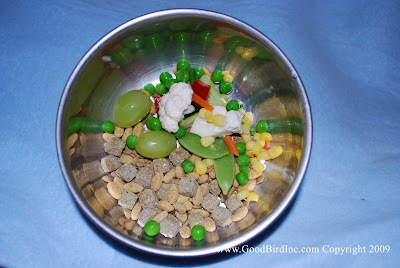 Every day I feed my parrot about 1/3 cup of pellets, 1/3 cup of mostly veggies and some fruit, a few sprouts and sometimes a small piece of birdie bread. He usually leaves some behind, drops a few items he may not prefer, and sinks a few things in his water bowl. 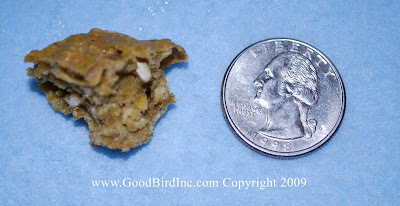 But essentially he gets a tiny bit more food than he likely needs to be satiated and maintain a healthy weight. Here is a photo of the leftovers in the morning. For his training session I use sunflower seeds and pine nuts as treats. He only gets these for training, good behavior throughout the day and sometimes in foraging toys. But he pretty much never just gets them dumped in his food bowl. 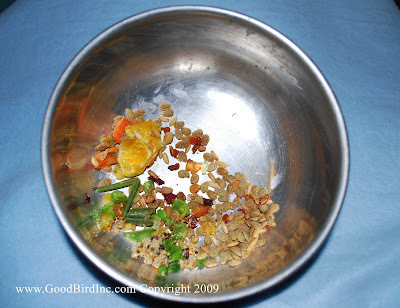 So rather than getting too wrapped up in strict diets and regimens, try these simple strategies and see if they can help your parrot gain some enthusiasm for what you have to offer. Check out the videos and you will get an idea of what can happen. I have long said if I get hit by a bus tomorrow, it will be OK. I have had a pretty good ride. One of the cool things I get to do is travel around the world to teach people about parrot training and behavior. Not a bad gig if I do say so myself. Traveling a bunch means trying to find a way to communicate with many different parrot people of many different nationalities. I wish I was proficient at several languages, but I am afraid English and enough Spanish to be dropped in the middle of Mexico are about it. Fortunately there are some very kind people out there who have generously translated my writings. Here are two that have been translated to Russian. How cool it that? And The Parrot Problem Solver is soon going to be released in Japanese. Woohoo! I am really floored, honored and so very happy people are finding these resources helpful in other countries. It really is a nice big warm fuzzy to think something you do may help people and their parrots around the world. It is not as fabulous as having a real live person translate something, but I did add a google translator to my blog. It is on the right hand side under by bio. It is not perfect but it can help give the idea of what is going on in my writings. I hope it helps foster this global growth of the positive reinforcement approach to working with parrots.